21 September 2011, i was at the park having a picnic, well sort of. I bought donuts and i ate at the park. It was great and relaxing. I was there from 4pm to 5pm i think. It's not unusual to see me hang out alone. I used to be alone almost all the time when i studied in a University long ago. I saw couple of lovers at the park, hmm.. i have never felt that. I mean to be with someone that is so special to you. How does it feel? 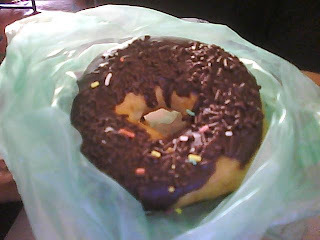 I brought home this donut. Cannot finish eat this at the park. Too full. Since June, i have already felt the love and something miracle happened because my heart felt warm and it felt like we are so close together althought we are miles apart. I have never felt this feelings i swear. I just think i need to protect this feelings. But honestly, i have already felt this feelings since i stalked her in 2009 but the feelings were like tiny and small and now it is huge and bigger than anything that you can imagine. I wish i can walk with her and touch her hand when i get there. Hmm, when she doubted me last night, i was kinda upset. But thanks to her for expressing her doubt because i really need that to improve my own self. Now i know, doubting someone else is not good.